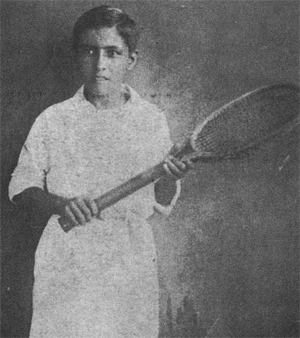 A rare photo of the teenage Pancho Segura on the verge of South American tennis stardom. Pancho Segura returned home from Quito in the spring of 1938. (Click Here for part one of his incredible story.) He had been three months away from home, in the cool mountain altitude, playing tennis every day. When he appeared at the Guayaquil Tennis Club for the first time after his absence, he was transformed. Stronger, faster, fitter, he was playing brilliant tennis. He was also extremely competitive. When he played with the members, he played to win. The club players were impressed. Some of them realized Pancho could be of immense use. Coming up was the annual tennis tournament between Guayaquil and Quito. The two major cities in Ecuador enjoyed an intense political rivalry, and the tennis tournament was no different. It was represented the most important championship in the country. That year a group of members of the Guayaquil Tennis Club decided· they should invite Pancho to participate in the tournament. Pancho Segura? Play for the Guayaquil Tennis Club? A lot of people were outraged at the suggestion. The ball boy? He wasn't a member and could never become a member. How could the caretaker's son represent the cream of Guayaquil in such a socially important sporting event? Moreover, he was professional, wasn't he? Hadn't he taken money to play with the members over the years? So what if it was only fifty cents? The club could not countenance any threat to its amateur status. The outcry was loud and persistent. Pancho had knocked on the door of a world that would never forget where he came from. At the age of sixteen, he was discovering how many obstacles there were for him if he continued his career in tennis, not just physical and mental, but social. The physical and mental barriers he had already proved he could negotiate successfully. The social ones presented a more intangible and complex threat. It took some cunning maneuvering to solve the problem of getting Pancho to Quito. There was no way he could represent the Guayaquil Tennis Club. But his supporters found a way around this ruling by having the young player represent another club in town, which was happy to sponsor him in the tournament. So Pancho Segura went to Quito. It was his first appearance on the national tennis circuit, a moment he had been working toward for years. But he was made to pay a painful price for his acceptance. 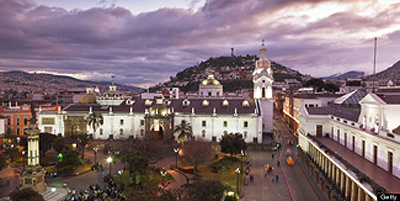 Quito, arch rival in politics and tennis with Segura's hometown of Guayaquil. His teammates were not pleased being told to play with this social upstart, and they expressed themselves in the subtle and not subtle ways of class superiority. They would not let him sit with them on the train trip to Quito, forcing him to travel by himself in a third class compartment. He was not allowed to eat with them, either. The club players went out for pork chops, leaving him behind. Since he had no money, he was reduced to buying plantain chips from a street vendor. Pancho accepted this treatment without bitterness. 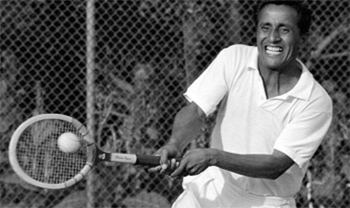 His job was to play tennis for Guayaquil, and he responded fervently. He won all three of his matches, contributing to Guayaquil's defeat of the longtime rival. "We beat the hell out of them," Pancho observed with a satisfied grin. On the way home, his teammates were more respectful of the ball boy. On the train back to Guayaquil, he was allowed to sit with the rest of the group. After this triumph, Pancho was no longer an unknown player. Many people had watched him play in Quito. The speed! The anticipation! The two-handed forehand! Spectators were astonished. One man in particular was startled by the talent shown by the dark teenager from Guayaquil. 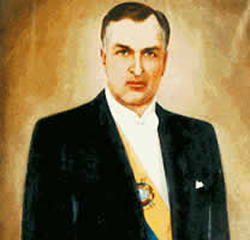 He was Galo Plaza Lasso, president of the Ecuador Olympic Committee, who later became president of Ecuador. Plaza had been educated at Georgetown University in the United States and was an imposing man of considerable elegance. He decided to invite Pancho to join the Ecuador tennis team entering in the Bolivarian Olympics in Bogota later that year. Once more, there was resistance. Peru, a participating country, again brought up the issue of Pancho's professional status, and again, his supporters scoffed at the allegation. Plaza went so far as to threaten to boycott the games if Pancho were banned. The Peruvians withdrew their objection, and Pancho was accepted as part of the Ecuador delegation. The people of Guayaquil had a new popular hero. "The day he left," his mother said, "he was seen off by a musical band." Her pride was palpable. This was by far the biggest thing that had happened to her family, and she could only wave, weep, cheer, and pray for him. Tennis pundits believed that Venezuela and Colombia were the favorites to win the medal with Peru a close third. But a few spies had heard about the Ecuadorian sensation and were openly saying that Pancho Segura was the man to beat. From the start of the games, this was the case. Segura's first match was against the Colombian Gaston Moscoso. Although heckled by the crowd who called him a "professional champion," Pancho ignored the distractions and beat Moscoso in three easy sets. The Ecuadorian then faced the Peruvian champion, Carlos Acuna y Rey, and beat him even more easily. Acuna was furious at being defeated by a nobody and refused to be photographed with him after the match. In the semifinals, Pancho rolled to another three-set win against the Bolivian champion Gaston Zamora. On August 13, 1938, the gold medal final was between Pancho Segura of Ecuador and Jorge Combariza of Colombia. The tournament was in an uproar. Pancho's style of play, his two-handed forehand, his speed and his spirit, were the talk of the games. Future president of Equador, Galo Plaza Lasso used his influence to see Segura was allowed to play in the Bolivarian Olympics. All the players and fans wanted to see for themselves this new kind of tennis played by a short, unknown player from a small town in Ecuador. Crowds poured in. Tickets were scarce. Back home, El Telegrafo promised to transmit the game through Radio Nueva Granada. People in Guayaquil waited in the streets to hear about the triumph of their prodigy. Combariza was the favorite and received cheers as he appeared on the court. Pancho followed him to polite applause. The contrast was striking--the athletic-looking Colombian with his wealthy entourage, striding grandly on to the court like a pasha, and little Segura, just eighteen years old and weighing 120 pounds, darting quickly to his side of the net, eager to begin. Pancho was nervous and lost five games in a row. The Ecuadorian fans in the bleachers started to urge him on, and he responded by winning the next five games, but still lost the first set 7-5. But Pancho began to find his form in the second set, and won it 6-4. By then, he was "in the zone," as he would say later. His shot-making became precise, his speed more daunting, his overheads immaculate, his baseline drives like bullets, his volleying faultless. "I was too quick for him," Pancho said later. "I was at the net before the ball had landed on the other side." Combariza had no chance against the whirlwind and lost the last two sets by the humiliating scores of 6-1, 6-1. The spectators rushed down from the stands to congratulate the champion, and his delirious teammates hoisted him up on their shoulders and marched him in a victory parade round the court. Et Telegrafo published an AP report that said, in part, "Critics who went to the singles finals all agree that the encounter between Francisco Segura and Jorge Combariza was the best match they saw in Bogota. They also affirmed that Segura exhibited the best tennis of all those observed throughout the tournament." Another view of the forehand Jack Kramer called the greatest in tennis history. But the Guayaquilenos had to wait to celebrate. The Radio Nueva broadcast never came through, and the news was ultimately transmitted by phone to the local firemen. As their sirens began to reverberate throughout the city--for once not warning about a fire--everyone started shouting and cheering and jumping up and down that their "favored son, in this hour of triumph, had snatched another shred of glory for his beloved Ecuador," as El Tetegrafo put it. Segura was eighteen years old. His rise had been meteoric. From a ball boy hitting for the club members in Guayaquil, he was now an internationally known player and the national champion. His return home to Guayaquil was that of a hero. People flocked into the streets in droves to welcome him. A ticker tape parade was organized. Kids shouted his name as he walked in the streets, travelers on the buses stuck their heads out of windows to salute him. "Everyone invited me into their homes," Pancho remembered. "The delegation gave me a big welcome. I got medals, banners in my honor, everything!" A street was named in his honor. It was after this triumphal recognition that the impossible decision was made to accept him as a member of the Guayaquil Tennis Club. During 1939, Pancho Segura represented Ecuador in four major South American championships--in Uruguay, Chile, Brazil, and Argentina. He won all of these tournaments. Perhaps his biggest victory was at Millington Drake Stadium, in Carrasco, near Montevideo, against the Argentine champion Lucilo Del Castillo. Most fans there had not seen the double-handed tennis player from Ecuador, with the wicked ground strokes and exceptional speed. Anticipation ran high, and as play progressed it was soon clear that Del Castillo was being seriously challenged. At one set apiece, Del Castillo had a set point, which Segura negated and then went on to win the set II-9. This long set was the turning point. There was no hope for Del Castillo after that. Pancho won the match in four sets. Argentine champion Lucilo Del Castillo with Segura after a four set to the 18 year old. There was still one more match to play. It was for the tournament cup, played in the presence of the British ambassador, Sir Eugen Millington Drake, for whom the Carrasco stadium was named. Sir Eugen was a great tennis enthusiast and headed the Uruguayan Tennis Federation that had initiated the tournament. Pancho's opponent was the Uruguayan champion Sebastien Harreguy, playing on his home turf. The crowd roared its support for him as the players walked on to the court. On this tense occasion, Pancho found it more difficult than usual to read the other man's game. After winning the first set 7-5, he lost the second and third 1-6, 0-6. The crowd began to mutter and murmur. But Pancho showed the spirit and tenacity that were to become the hallmarks of his style. Like all great players, he found a way to raise the level of his game, and by picking up speed and driving his shots with more power and accuracy, he won the fourth set 6-1. This unsettled the Uruguayan and his fans. Harreguy showed signs of fatigue at the start of the fifth set and temporarily left the court with leg cramps. The delay failed to restore him, and he lost the final set 6-3. Sir Eugen Millington Drake presented Segura with the trophy. From this championship Pancho went on to others, in Chile, Brazil, and Argentina again. Each time he returned home his name was bigger. His image was everywhere, always the wiry, dark-skinned young man holding his tennis racket in both hands, his face illuminated by a wide, infectious grin. El Telegrafo said: "Segura has been the youthful exponent of our people, who has shown our brother nations the vigor of our race, the unbreakable strength of its will, its dignity, its discipline, and courage." This nationalistic language was in part an effort to give hope to the poor and disenfranchised masses of this small, struggling country, whose sufferings were forgotten in the temporary glory of one of their popular heroes. He was a criollo (a commoner), not a seilor (a patrician), and his victories gave hope to thousands of those sharing the poverty that he had endured. His old supporter from the tennis club, Agustin Febres Cordero, gave Segura $500 to send to his mother. The situation was deeply ironic, because becoming a national hero meant nothing in financial terms. Although his parents had begun to enjoy the enormous public acclaim their eldest son was receiving, their incomes did not change, and the same old difficulties still haunted them as they continued to look for ways to bring up their large family. "My parents began to think they were aristocrats," Pancho said. “But my success didn't bring in any money." Only after newspapers and friends picked up the story of the Segura Cano family's continued poverty did the municipality of Guayaquil respond and give them a piece of land on which to build a house. It was on the corner of Cuenca and Quito streets. The building contained a ground floor shop to bring in rent, and a modest upstairs apartment with four very small bedrooms, a living/dining space, and a tiny kitchen. It was hardly big enough for such a large family, but at least it was theirs, and members of Pancho's family still live there. But still unable to afford transport, Pancho had to make a twenty-minute walk every day to and from the tennis club. From time to time, Pancho's rich friends at the club slipped him money, clothes, supplies. On one occasion while playing abroad, Agustin Febres Cordero, his old supporter, friend, and former president of the club, gave him five hundred dollars to send to his mother. But other influential friends had greater ambitions for their gifted native son. 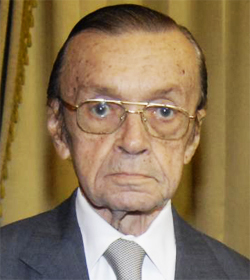 Galo Plaza, his old patron, was now president of Ecuador. Continuing his interest in the local hero, he suggested that Pancho go to study tennis in France. France was one of the foremost tennis-playing countries in the world, along with Great Britain, Australia, and the United States. 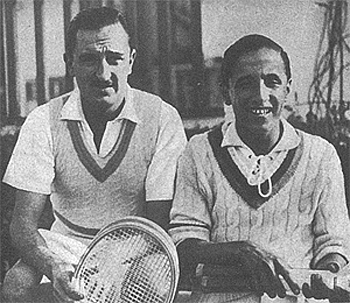 Wimbledon doubles champion Elwood Cooke was instrumental in helping Segura get to the United States for the first time. Plaza thought France would be an easier place for the inexperienced, poorly educated young South American to feel at home in than the cutthroat competitive world of the United States. In France he would have the opportunity to refine his game and become an international star for Ecuador and put Ecuador on the map in spectacular fashion. No other Ecuadorian athlete to that point had come close to Pancho's international success, and Ecuador was prepared to sponsor him by giving him an allowance to live abroad. But the course of world history changed that. Pancho was playing in a tournament in Argentina when war broke out in Europe. "I saw German warships in the harbor in Buenos Aires," Pancho said. "I knew what that meant." It was now impossible for him to go to France to play tennis. "It wasn't the greatest break of my life," he declared later. In spite of this setback, fortune soon shone on him again. His fame had spread and was to reach the shores of a country he had only dreamed about. 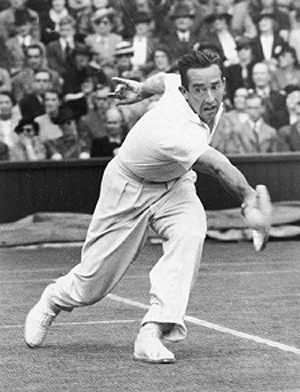 Elwood Cooke was one of the top amateur tennis players in the United States. In 1939 he had lost in the finals at Wimbledon to Bobby Riggs, with whom he then won the doubles. Cooke had read about the young sensation from Ecuador, Francisco Segura, and when he made a visit to Guayaquil in the spring of 1940, on a goodwill mission with Wilson Sporting Goods, he asked to see the champion. 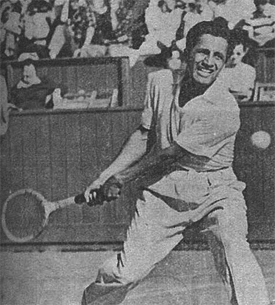 In June 1940, Pancho Segura, with the support of Elwood Cooke, Wilson Sporting Goods, and a promised monthly stipend of one hundred dollars from the Guayaquil Tennis Club, set off for the United States of America as a "special representative of the Sports Ministry." "Mama," Pancho told her one day, "they have given me a grant, but I am sure that you will not let me go." But Francisca Cano Segura was made of sterner stuff. "I was a little sad because my son was leaving me," she conceded later, "but I saw the reality of things and I told him, but son, why do you think that I won't let you go? Of course I want you to go, so that you will get to know and understand what life is." Pancho Segura sailed on a Grace Line ship, one of those huge white steamers he had gazed at so longingly from a distance as a child. Now at last, his yearning was a reality. Accompanied by Juan Aguirre, another tennis player from Guayaquil, he was on board one of the magnificent vessels of his dreams. The sea voyage was thrilling to the novice traveler, particularly crossing the Panama Canal. He was enthralled by the miracle of engineering that created it--to be able so quickly to cross from one continent to the other. Throughout the journey, Pancho had a wild and wonderful time. He used to spend hours in the ship's nightclub, listening to the performers singing the popular hits of 1940 in English, even though he didn't understand a word. The young Ecuadorian was free from the constraints of his home life and the culture of his country, and he could hardly contain his delight. He was traveling to a strange country, where he didn't know a soul. He had no money. He faced an unknown future, speaking not a word of English. There was no turning back.